I recently signed a contract with a local t-shirt shop, and it sent me scrambling. I wanted to submit material immediately to, if nothing else, show them what I had in mind. They signed my contract without seeing as much as a doddle, so I need to prove I'm serious about this. I dug through my old newspaper art to see what I could rework into a shirt design, and I found something that sparked an idea. 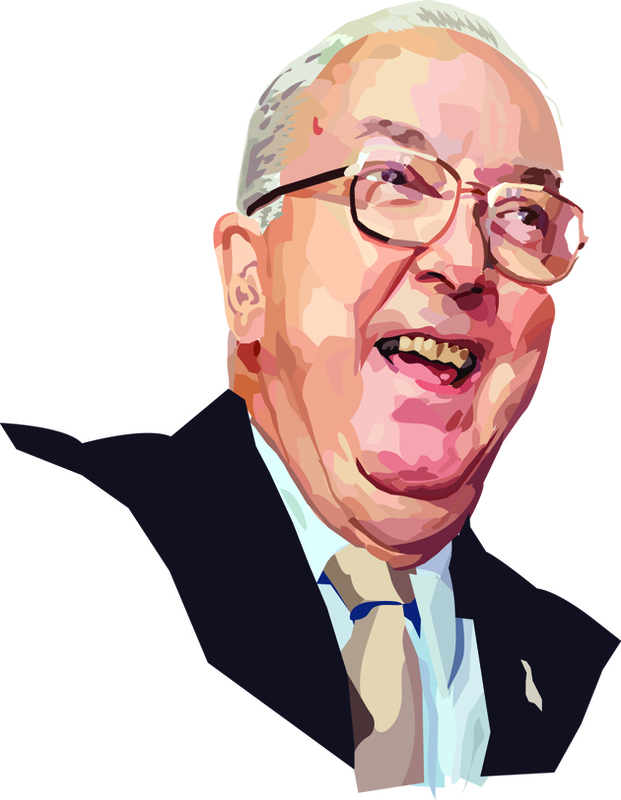 But for that idea, I needed to make a new piece, and I decided it would be of longtime North Carolina Jesse Helms. I found an image and recreated it, Shepard Fairey style, in Adobe Illustrator. Now, yes, Illustrator's Live Trace can accomplish much the same thing, but I find its results to be flat. And it feels like a cheat. I was doing this kind of spot-color recreation years before Illustrator provided the same style of artwork. I like making art this way -- color field by color field -- and I think the result is stronger than what Illustrator hands you when you click the mouse. When I hear from the shirt shop (yea or nay), I'll post the final design that includes this work. I traced the original foreground and background layers onto one artboard with a lightbox and held my breath for a week, waiting for the mindless mistake that would make me start the final version all over again. It came more than halfway through the inking. 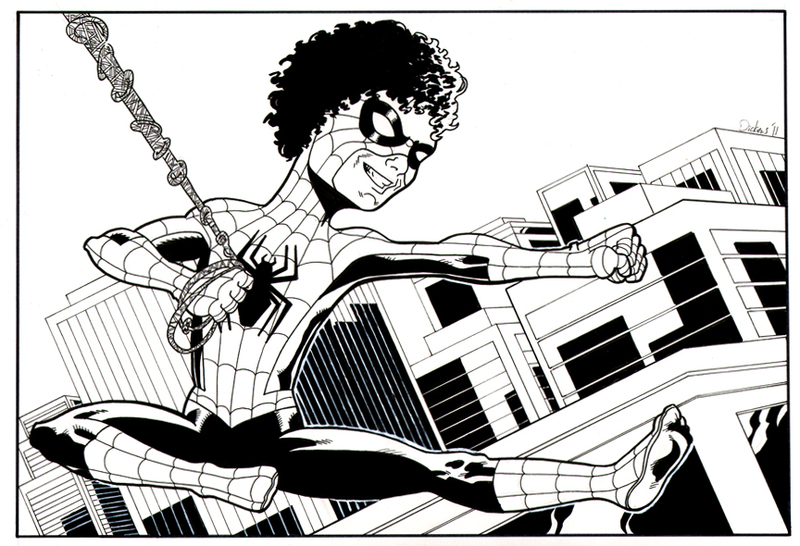 See that tallest building behind Spider-Girl? See the section under her left arm? I inked that full black. It was a flat block of black. As soon as I held the page at arm's length and looked at it, I knew I screwed up. And I had only two options: Start over or salvage in as efficient and clean a manner as I could imagine. Instead of starting a new artboard, I decided to draw lines in white using acrylic paint. Because it would cover black ink, I knew it wouldn't be as bright a white as the uninked paper. But I could layer that paint, even though it might get bulky. It would accumulate like a stalagmite off the page, and that would be tricky for whatever framing her parents wanted. So I put down the lines using my smallest acrylic brush and my beloved rolling ruler, making the lines as slim and straight as possible. When they dried (and they do quickly, even on day-old ink), I used the ruler and my thickest Micron pen on either side of the paint lines to cover it with ink, leaving white lines approximately as thin as the original black lines. That paint takes on a bluish hue over the black ink, but the lines are so small that the slight color helps sell the illusion of distance. I also used the paint to thicken the white border separating Spider-Girl from the background, making her pop forward more. There are still some things I'd like to change, but I think it came out well. It's clean, and I like the variety and arrangement of the buildings. I think I managed to use her requested spider-pose well. 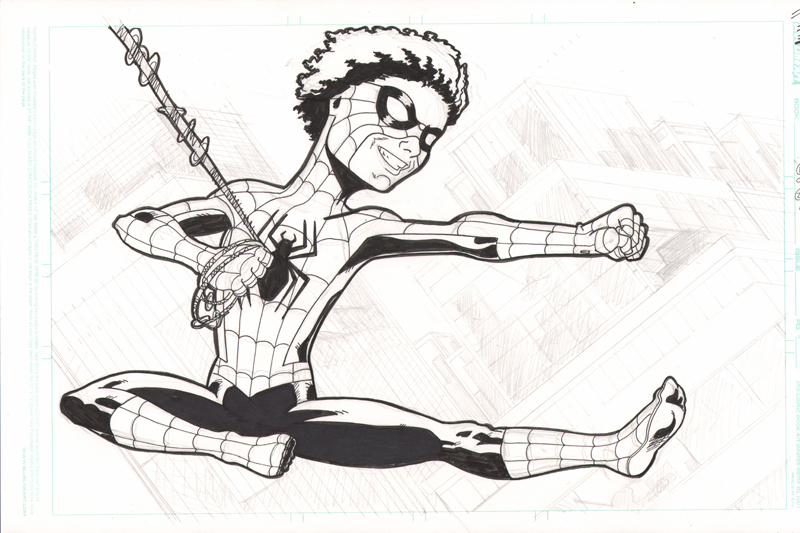 I tilted the background intentionally to balance the pose and create a sense of movement, and I left the space over the buildings blank as a negative-space balance. Had I drawn clouds, I would have reached for my .005 Micron, a pen whose nib could split atoms. And now onto the next piece. 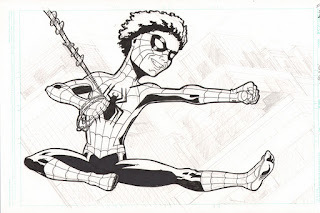 A couple of friends requested artwork of their oldest daughter in a tweaked Spider-Man costume. "Does she want one of the Spider-Woman/Girl costumes?" No, they said. Spider-Man. She even has her own Spider-Man pose. I made some reference images as I played with composition, but they didn't work well on the page. After a couple of false starts, I drew a full image on one piece of board, and then split the foreground and background onto separate pieces. This let me finesse each component and find my mistakes before making a final drawing. The building reflections worked better in the pencil sketch. When I played loose with them on the background ink, the illusion failed. 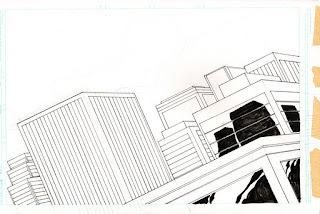 When I'm ready to move to the final artboard, I can move around the figure for the best placement over the buildings and then add black reflections based on the figure's black areas. I want the background to be noticeable but stay back; it shouldn't compete with the figure. I've also, since these scans, fixed the torso webs and redrawn her curly hair. I showed them the figure image a few weekends back, and they seemed happy with it. I can move forward with a scoash more confidence.